Do you know where to early vote in your community? Find out, but be prepared for some frustration. It may not be that easy. It may be even more difficult to find out what is on your ballot. You might begin with the search "sample ballot for 2018 local election for [name of your city]. If you live in Dallas County, you might try https://www.dallascountyvotes.org , but again, be prepared for frustration as search features for information are not exactly intuitive. ONLY YOU CAN BRING REPRESENTATIVE GOVERNMENT TO YOUR LOCAL COMMUNITY! 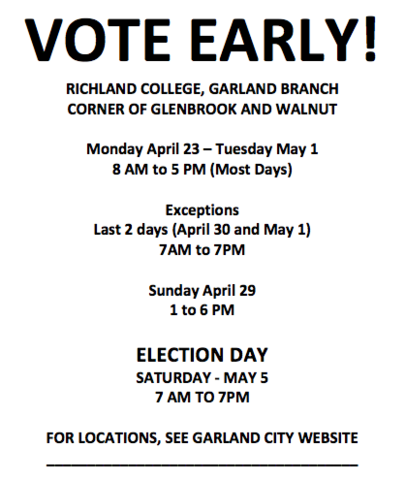 Last year only 3.9% of the registered voters in Garland turned out in our local election to vote. This means that we probably don’t have a representative government in Garland because the majority of registered voters did not cast a ballot. Contact your Garland City Council Representative and ask them to send you a SAMPLE BALLOT. THEN STUDY IT AND VOTE ACCORDING TO YOUR CHOICE. Note: District 2 ballot features two candidates, but only one, Deborah Morris is running for office. The other candidate has not only withdrawn from office several months ago, he is supporting Ms. Morris. There are numerous true stories out there on dead politicians winning races. This year Garland Texas has its own crazy voting story. One of the two candidates for City Council in Garland's second district, Rex Wisdom, withdrew from the ballot too late to have his name removed from the ballot. He has even publicly in writing endorsed his former opponent, Deborah Morris: "For personal reasons I am no longer running for City Council in District 2. Although my name will appear on the ballot, I will be voting for Deborah Morris. Deborah and I have talked at length and I believe she will bring a wonderful change to the Garland City Council. Please join me in supporting her as she works to make Garland an even better place to live than it is now." You may think THAT is strange but here is an even stranger twist to this story: Given Texas and its insane voting laws, if Rex Wisdom garners more votes than Deborah Morris and, provided that he turns down the job, the current council person for District 2, Anita Goebel, will continue to serve for another year--even though she was recalled by the voters in her district in December of 2017 and even though May ends her six year term limit.